A thank you speech and heartfelt words in a note can mean so much. Everyone values being thanked and we all enjoy feeling appreciated. 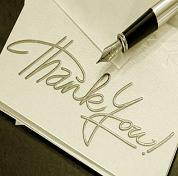 A thank you note can take just a moment of your time, yet it can brighten the recipient's day immeasurably! Take a moment to read through the words of wisdom and gratitude, personalize them and then buy or even make your own thank you card. Hand write your special message - a beautiful handwritten card remains a special gesture and one that is sure to be appreciated. your thoughtful, kind gesture certainly made my day. Yet you searched till the perfect gift you found. I so appreciate that you took the time to remember me. Words of gratitude in a card can also be read out loud at a special function - especially if you have the odd butterfly flying around in your stomach. It is perfectly acceptable, especially if you are feeling a bit emotional, to preface your speech with something like: " May I take the opportunity to read you the words of thanks that I wrote in my card."